Kate is a highly experienced Facilitator and Executive Coach with over 20 years of working at senior levels in a variety of blue chip organisations and SME’s. Kate is a Speaker, Facilitator and Executive Coach with over 20 years’ experience of working at senior levels in a variety of blue chip organisations and SME’s. 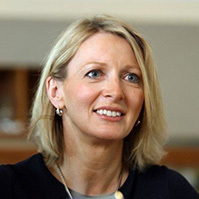 In the last 24 months Kate has worked with Executives, Boards and Leadership teams across Ireland, UK, and North America. Kate has previously worked with top teams within large Global organisation and spoke on exceptional Leadership to many leadership teams in past 4 years. Earlier in her career, Kate gained experience as a leader through various senior executive and Director roles in both Retail and Manufacturing as a buyer and sales manager, with particular responsibility for development and business growth. Her passion is building “Business Athletes” – taking executives and teams to the top of their game. Along side KM Consultancy, Kate is currently Vistage Chair and Speaker, Chair of Women in Business NI, member of Arrow Leadership Ireland and North America and passionate about all things that create opportunity and possibilities. Kate had an MSc in Leadership and Coaching and is qualified in a number of leadership and Psychometric tools including Insights Discovery. "I was part of the Vistage Group that you presented to yesterday in Tunbridge Wells (Chris Hughes's Group). Your presentation was one of the most insightful, inspirational and enjoyable it has ever been my pleasure to attend. It has left a lasting impact on me. I thank you for sharing and hope that our paths may cross again one day. I wish you every success and happiness for the future." "I just want to take the opportunity to thank-you very much for sending me on these courses with Kate. I learnt so much from Kate in regards to management skills together with working with a team but also individuals on the team. Kate is inspirational in her methodology of teaching management skills and gets everyone thinking and putting in to practice all the theories she has equipped us with." to create new solutions with old thinking. If we want to find new ideas or solutions we need to think differently to ensure we make better decisions, Creating daily decisions that become defining decisions which turn into defining moments. We know the quality of our thinking determines the quality of our decisions and ultimately our lives - we must learn to ask outstanding questions to agitate our thinking towards better decisions, better teams, and better results. Our workshops focus on making better decisions. Kate Marshall Ltd was formed in 2013 to enable a group of highly effective, inspirational thought leaders to provide bespoke solutions for our clients. In the past 18 months Kate has won 3 national awards for out performing as a speaker and Chair of Vistage International. For each client we select the best facilitators for your team. We bring a fresh approach to developing competent leaders who create and articulate a Vision that inspires others to lead. We help you attract, identify and develop talented leaders who will deliver exceptional results. Authentic Leadership, of self-first, then of others, then an organisation. Humility, Accountability and Courage are the currency of authentic leadership. This creates high engagement and creates leaders who understand that authentic, honest conversations are the key to developing a high performing culture that is built on trust. How do you change a culture? One conversation at a time. who have a passion to grow and develop. Hi Kate, Just a quick note to say how great it was to see you again today and to have the privilege to be in another one of your workshops. It was such an energizing, empowering, and stimulating session...I could literally feel the positive energy your were creating building up like static electricity during the session. I was buzzing by the end of it. Thank you for all the passion and energy you gave to us today, all so unconditionally, and for your wisdom and limitless willingness to learn, share and teach others. It was so appreciated and valued. You will be exhausted I am know...so I hope you can chill out, reset and recharge fully before you have to do it all again! Thanks Kate and thank you for another fantastic session. The Group absolutely loved it and a few said you were the best speaker yet – praise indeed as they have loved virtually every speaker!! It was our pleasure to invite you to Citi and we look forward to having you back again in the future. We also are very pleased with the turn out and the feedback has been fantastic - the discussion was even trending on out Collaborate (social media website) and made it to second place, which is very impressive. I attend the talks you gave yesterday at Citi in Belfast. I just wanted to send a quick message of thanks. It was very inspiring and you have definitely made a difference to me. Thanks again.